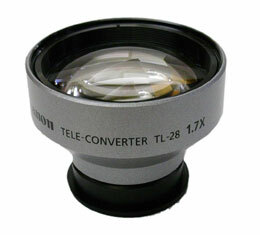 The TL-28 extends your telephoto viewing by a factor of 1.7x, to 340X on the Elura 40MC when shooting video. This accessory lens screws onto the front of the camera's zoom lens. Also works with the Elura 50MC, ZR100 & ZR200.